5.0 Earthquake hits La Paz, Bolivia. Tropical Storm Gorio made landfall at 8 am on Saturday, June 29, in Hernani, Eastern Samar, Philippines. Packing maximum sustained winds of 65 kph and gusts of up to 85 kph, Gorio was moving northwest at 19 kph. On Sunday, Tropical Storm Gorio was located approximately 64 nm westward of Manila, Philippines. Heavy rainfall and floods have collapsed more than 272 houses in Huanan since Monday. A landslide caused by a heavy rainstorm has claimed the lives of at least two people. Similarly, hail and flooding have affected more than 290,000 people in Mongolia. A total of 97,500 hectares of cropland have been flooded, more than 247 houses have been totally destroyed causing damage of 430 million yuan, the regional civil affairs department said. Experts say trade winds are declining, a drop that’s slowly changing life across the islands. Part of what makes living in Hawaii so pleasant is the gentle breeze. Arriving from the northeast, it’s light enough that it is barely noticeable but strong enough to chase away the humidity. The effects of the decline in the trade winds can be seen from the relatively minor – such as residents unaccustomed to the humidity complaining about the weather and having to use their fans and air conditioning more often – to the more consequential – including winds being too weak to blow away volcanic smog. The winds also help bring the rains, and their decline means less water. It’s one reason officials are moving to restore the health of the mountainous forests that hold the state’s water supply and encourage water conservation. Scholars are studying ways for farmers to plant crops differently. It’s not clear what’s behind the shift in the winds. A study has shown a decades-long decline, including a 28 per cent drop in northeast trade wind days at Honolulu’s airport since the early 1970s. These days there are fewer waves to surf because the winds are arriving less often. Sometimes the winds are too weak to blow away the volcanic smog, or vog, created by sulfur dioxide erupting from Kilauea volcano on the Big Island, leaving a white or brownish haze hanging over Honolulu. This aggravates asthma and other respiratory problems. For now, the most important consequence will be declining rainfall and a drop in the water supply, particularly as Hawaii’s population grows and uses more water. Trade winds deliver rain to Hawaii when clouds carried from the northeast hit mountainous islands built by millions of years of volcanic eruptions. These rains, together with rainfall from winter storms, are the state’s primary sources of water. On Oahu, the rain feeds ground aquifers that supply water to about 950,000 people in Honolulu and surrounding towns. Residents are reporting streams near their homes are flowing lower than before. Scientists don’t know if this is a downward trend or just the lower leg of a long-term cycle. Fuego (Guatemala): Explosions have become more violent, the latest special bulletin of INSIVUMEH indicates. Mild strombolian eruptions have turned into more powerful vulcanian-type explosions, which eject dense ash plumes rising to 800 m and produce numerous avalanches of blocks around the crater, especially on the southern flank. Shock waves from the explosions could be felt in areas up to 15 km distance, and rattled windows and doors in houses of Panimaché, Panimaché II, Morelia, Santa Sofía, Sangre de Cristo and were sometimes heard as far as Yepocapa and Alotenango. Fine ash fall occurred in Panimaché, Morelia and Sangre de Cristo. A relatively new strain of the swine flu virus that sickened more than 300 people last year is back again this summer, according to the Centres for Disease Control and Prevention. The strain, called H3N2 variant virus, infected four people who visited a county agricultural fair in Indiana this month. None of the infected individuals were hospitalized, and none died. Because this virus is typically transmitted from pigs to people, the CDC officials are urging people at high risk for flu complications — such as young children, the elderly and those with underlying health conditions — to avoid pigs at county fairs. An outbreak of meningitis in Russia, which occurred nearly a month ago, has failed to subside yet, contrary to doctors’ forecast. The first cases of the disease were registered in Rostov-on-Don. It has spread to other cities – Astrakhan, Lipetsk and its region, Nizhni Novgorod and Moscow. The Department of Health (DoH) in the Philippines confirmed yesterday an outbreak of chikungunya disease in Patnongon, Antique, with 313 cases as of April, this year. The symptoms of chikunguya include fever, rashes, and severe joint pains. There is no known cure for chikungunya but it is rarely fatal. A tidal surge and torrential rains have been hitting the Noakhali region in Bangladesh since Wednesday. At least 25,000 Bengalis have been affected by flash floods in Hatiya, Subarnachar and Companiganj upazilas of Noakhali with more than 11,500 hectares of paddy washed away. A blustering blaze burning in southern New Mexico’s Gila National Forest has swelled to 158 square miles as more than 700 firefighters work to keep up amid a record heat wave. Fire officials said Friday that the Silver Fire continued to advance primarily on the northwestern edge of the blaze. Eastern winds fueled flames on the west flank and pushed smoked over nearby towns. The inferno is still only 20 percent contained and burning 20 miles northeast of Silver City. No new evacuations have been ordered, however, some area roads and highways remained closed. Meanwhile, crews in northern New Mexico continued to battle Friday a nearly 16-square-mile wildfire in the Pecos Wilderness. Officials say that blaze was moving closer to the headwaters of the Pecos River. The Lime Hills Fire received much some needed rain over the past couple days, up to 6 tenths of an inch. The fire shrank 46 thousand acres over 24 hours, according to the Alaska Interagency Coordination Center. It now stands at about 220 thousand acres. Etna (Sicily, Italy): Except for a small swarm of earthquakes on 20 June, Etna continues to be calm. Pagan (Mariana Islands): The volcano continues to emit a strong steam and ash plume visible on satellite images. This activity has been typical of Pagan in the recent months, but no ash emissions could be detected. Veniaminof (Alaska Peninsula, USA): Volcanic tremor and small explosions continue to be detected in seismic data indicating that the eruption of lava and minor amounts of ash and steam continues. Satellite images obtained over the past 24 hours show elevated surface temperatures at the intracaldera cone. 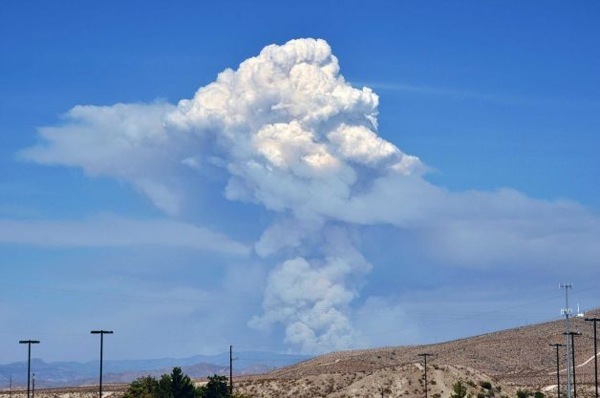 Web camera images from Perryville show a small light-coloured plume rising above the intracaldera cone to just above the rim of the caldera to about 8,000 to 10,000 feet above sea level and night time images showed a persistent incandescent glow at the cone. Pavlov (Alaska Peninsula, USA): Eruptive activity is continuing, but at a much lower level than earlier this week. The level of seismicity over the past 24 hours has continued to decline and now consists primarily of low level continuous tremor. Periods of continuous tremor are likely associated with lava fountaining and minor ash production, but at this level, emission rates are probably very low. Satellite data over the past 24 hours has shown strong thermal signals at the summit. Pilot reports from last evening have indicated that plumes are rising to levels not much above the summit of the volcano. AVO has received no reports of ash fall on nearby communities today. Telica (Nicaragua): A new earthquake swarm started this morning, visible on INETER’s seismograms. San Cristobal (Nicaragua): Seismic activity has been at normal, low levels during the recent days. Masaya (Nicaragua): Seismic activity remains low. Galeras (Colombia): Weak ash emissions occurred on Wednesday (26 June). Seismic activity otherwise has remained at low levels. Cumbal (Colombia): INGEOMINAS reports a decrease in seismic activity during the past week, but maintains “yellow” alert level for the volcano. Reventador (Ecuador): Weak eruptive activity continues with occasional steam and ash emissions during small explosions that create plumes reaching about 1 km. 5.5 Earthquake hits Atacama, Chile. 5.0 Earthquake hits Potosi, Bolivia. Tropical Storm Cosme weakens over cold Pacific waters. Cosme, which was downgraded from a hurricane to a tropical storm earlier in the day, was about 545 miles west-southwest of Cabo San Lucas, Mexico, with maximum sustained winds of 50 miles per hour and should become a remnant low in a day or so. A Landslide occurred on Jiugong Mountain in Hubei province in China. The landslide hit road maintenance workers claiming the life of one and leaving two others missing. Elvira in Finland has been hit by Finland’s biggest storm in a century combined with more than 28,000 lightning strikes. No serious damage has been reported. The week’s hottest temperature was 119.3 degrees Fahrenheit (48.5 degrees Celsius) at In Salah, Algeria. The week’s coldest temperature was minus 91.3 degrees Fahrenheit (minus 69.5 degrees Celsius) at Russia’s Vostok Antarctic research station. 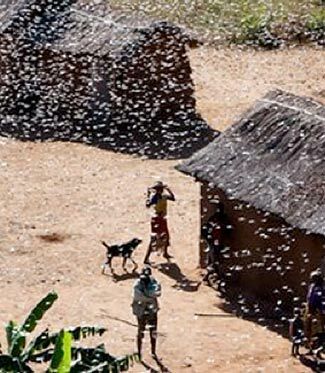 Madagascar risks having two-thirds of its crops overrun by locust swarms if it fails to act now, the U.N. Food and Agriculture Organization (FAO) warns. “This could very well be a last window of opportunity to avert an extended crisis,” said FAO Director General Jose Graziano da Silva. The country’s worst locust infestation in 60 years had spread across a wide swath of the country by early April, and FAO says the agency has been falling short in its efforts to raise funds from Western donors to combat the plague. “If we don’t act now, the plague could last years and cost hundreds of millions of dollars,” cautioned Graziano da Silva. Experts say there are now more than 500 billion ravenous locusts on the island nation, chomping through about 100,000 tons of vegetation each day. 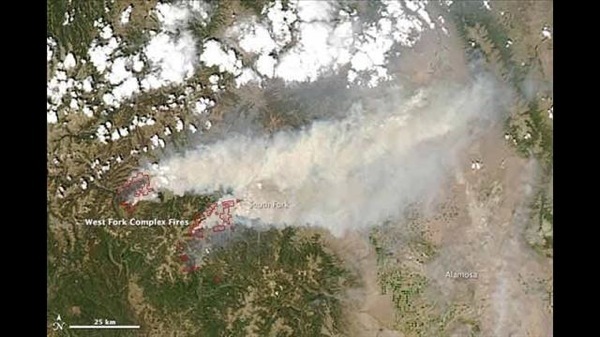 The massive West Fork Fire burning in southwest Colorado may look daunting from the ground but the view from space makes it look even more impressive. NASA released photos taken from the International Space Station. The series of images were taken June 19. 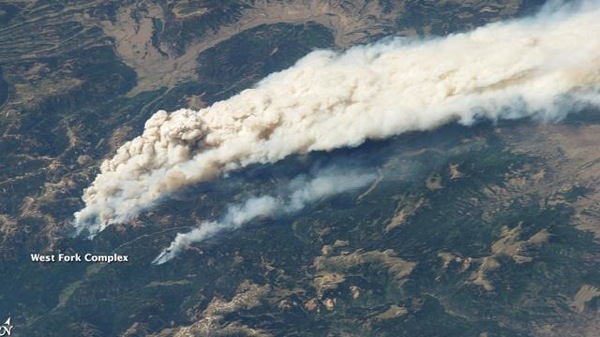 The images show a plume wafting from the West Fork Complex fire. To the northwest, a smaller plume from the Wild Rose fire is also visible. Bush fires raging on in Kuala Baram, Borneo. The Fire and Rescue Department (Bomba) recorded 177 cases of bush fires from June 1 till 25. Shiveluch (Kamchatka): A phase of intense activity occurred last night starting at 19:10 UTC, and lasting for about 40 minutes. The activity was probably a major collapse of the dome and/or accompanied by explosions. It produced a large ash plume rising to about 10-12 km altitude (VAAC Tokyo) into the atmosphere. Due to cloud cover, no direct observations could be made. A dust veil of reddish ash (likely originating from older, altered lava, suggesting that the event was largely characterized by partial collapse of the existing dome) engulfed the villages of Lazo and Klyuchi SW of the volcano where a layer of 1 and 2 mm of ash was deposited. Krakatau (Sunda Strait, Indonesia): The group of our current trekking tour on Java climbed the summit of Anak Krakatau on 24 June. Climbing there was very difficult, because of many hot fumarolic spots and strong degassing. The summit of Anak Krakatau is now higher than before the Sep 2012 eruption. One active vent was remaining in the west part. Pavlov (Alaska Peninsula, USA): The eruption had increased yesterday and produced ash plumes rising up to about 8.5 km (28,000 ft), but has decreased in strength again today. Seismicity had climbed to the highest levels since the beginning of the eruption, suggesting that the magma supply was reinvigorated into a new explosive phase. Ash fall was reported in communities to the southwest of Pavlof, including King Cove, at 48 km (30 miles) distance. Popocatépetl (Central Mexico): Seismic activity has picked up, suggesting that the volcano could be headed for more vigorous activity soon. SO2 emissions on NOAA recent satellite data have been relatively high as well. A magnitude 3.6 volcanic quake occurred on Tuesday night 23:57 local time and was located SE of the crater at 2 km depth. Over 3 hours of low frequency and short amplitude tremor were recorded. An earthquake swarms occurred yesterday as well and another one seems to have started an hour ago. Santa María / Santiaguito (Guatemala): Activity has not changed much overall, but the viscous lava flow on the south side of the dome has become more active and now produces frequent avalanches. INSIVUMEH warns that these can now sometimes turn into pyroclastic flows. Explosions remain rare and produce maximum plumes of about 1 km height. Ash mainly drifts to the SW and produces fine ash fall in the areas of Finca La Florida and Monte Claro. Pacaya (Guatemala): Mild, typical strombolian activity has established itself inside the Mackenney crater. “Dry” (not containing much ash) explosions occur frequently and eject incandescent scoria to about 25 m height above the crater and an intra-crater cone, now about 15 m high, is being formed inside the crater. Some of the explosions can be heard in up to 5 km distance. At night, glow can be seen from the crater.